It’s vintage, classic and full of character. Moen’s Waterhill collection brings elegance and class to your kitchen, with a faucet that looks like fresh from a farm and yet its vintage looks are a base for its ultra modern, effective performance. It sure comes with a price, but with such high quality that seems acceptable. Kohler Company is good at offering value for money. It is like the American standard faucet because it has the multi spray pullout but from then on the Kohler is in a league of its own. This faucet looks to last long with good high quality components fitted as well as being given a sleek and stylish look. Price Pfister’s Hanover collection of bathroom and kitchen faucets and fixtures combines Old World craftsmanship with unmatched styling. European-inspired contours and healthy silhouettes contrast the bathroom faucets’ high-arc spout for a beautiful look. They’re available in widespread and centerset configurations. For the other part of your bathroom, a tub and shower fixture or Rain Shower showerhead can help round out the look. 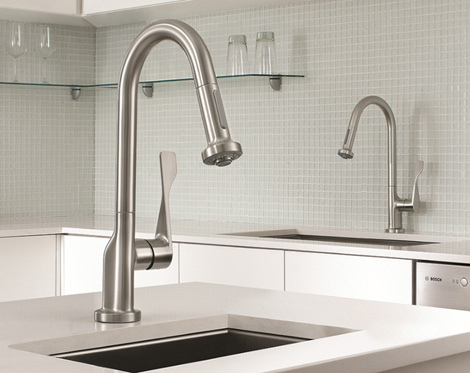 The pull-down spout of the kitchen faucets is bound to be a focal point. Single handle control, a matching soap dispenser, and three finish options help to make this faucet a must-have for your kitchen. Grohe makes domestic plumbing products of a very high quality. The Grohe Concetto is a little steeper in price to the others mentioned in this list, and yet from Grohe standard it’s very cheap. Concetto keeps true to the reputation of quality of Grohe. This is a heavy duty, impeccable functioning faucet worth every penny you spend on it and more. This is a faucet that’s affordable (cheap), at the price of this faucet it’s hard to even find a faucet let alone of such good measure. This isn’t the most high quality faucet for a house and I’d recommend it to be used in profit oriented projects, because this allows the landowners to keep the cost down and have a better than average quality faucet. Call Menifee Plumbing at 951-679-0732 for an inspection or simply to ask us for advice.